Planned at the same time as Cancun, it never has reached the same popularity. Zihuatanejo is a thriving community that has grown from a fishing village. It is composed of a natural bay surrounded by several beaches. 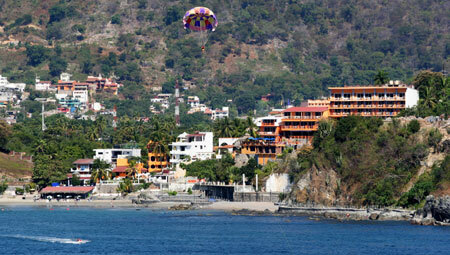 Zihuatanejo has a more authentic Mexican flavor and a large selection of inexpensive restaurants. Ixtapa/Zihuatanejo! Carved from the same hilly tropical coastline marked by scalloped coves, these Pacific Coast neighbors offer two unique versions of paradise. Considered one of Mexico's most modern resorts, Ixtapa offers sophisticated pleasures and world-class accommodations. Though the nightlife, shopping and restaurant scenes are more subdued here than in other destinations, there's still plenty of diversity. Golf, tennis, water sports and boutique shopping are just some of the options. It's also worthy to note that half of Ixtapa has been set aside as an ecological reserve, dedicated by the government when the resort was developed. Those looking for a more authentic cultural experience can head seven kilometers south to Zihuatanejo, a classic pueblo village criss-crossed by cobblestone streets. A pleasant contrast to the refinement of Ixtapa, rustic Zihuatanejo is set around one of Mexico's most picturesque bays. Activities center around the lively seaside promenade, laid-back cafes and wonderful markets. The two towns, just four miles apart, make the perfect combination for enjoying the best of both worlds while on vacation.